Huge Savings Item! Save 15% on the Zipp High Performance Rim Tape by Zipp at Melon City Bike Club. MPN: 00.1915.108.020. Hurry! Limited time offer. Offer valid only while supplies last. To guarantee a secure fit between rim and tire, we size our clincher rims near the maximum diameter allowed by ISO standards for 700c and 650c rims. To guarantee a secure fit between rim and tire, we size our clincher rims near the maximum diameter allowed by ISO standards for 700c and 650c rims. 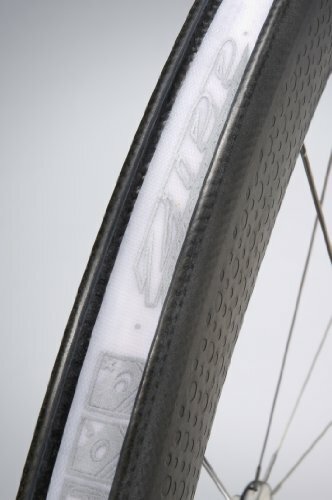 In order to give the tire bead more space to seat in the rim, we recommend using Zipp's ultra-thin rim tape. Especially with tighter fitting tires (e.g. Michelin and Continental), tire changes will be quicker and easier than with traditional cloth rim tape. 2 strips per box, available in 700c and 650c.